How often should a tree be trimmed? How much does it cost to cut down or trim a tree? How long does it take to obtain an estimate? How soon can my tree work be completed? Will tree pruning or tree removal work damage my lawn? What do you do with the wood and chips? What payment terms / methods do you accept? What is cabling and why would you do it? Enhances the shape and appearance of trees. Opens the canopy to additional sunlight encouraging new growth. Eliminates the danger of weak, heavy or overhanging limbs. Minimizes potential weather damage (wind, ice, snows, storms). Eliminates crowded or rubbing limbs and hazards associated with electrical wires, etc. Every three to five years should keep your trees healthy and looking good. Regular selective trimming is preferred over excessive one-time heavy pruning. Simple answer is, “it varies”. Each tree and location is different and the costs vary accordingly. Safety factors such as electrical lines or nearby structures affect pricing. HTS estimates are provided free of charge. Our goal is return your call within 24 hours. During our first contact, we will set-up a date and time to review your needs. A written estimate will be provided (in person, by e-mail or regular mail) within two business days of our site visit. Typically work is completed within 2 – 3 weeks of a confirmed work order. Preference given to emergency and storm damage work. Most jobs have minimal impact to lawns. If the ground is soft, we put down plywood to protect the lawn from equipment damage. Any potential lawn damage due to large tree trimming or removal will be discussed in advance with landowners. All wood and brush is recycled by HTS. 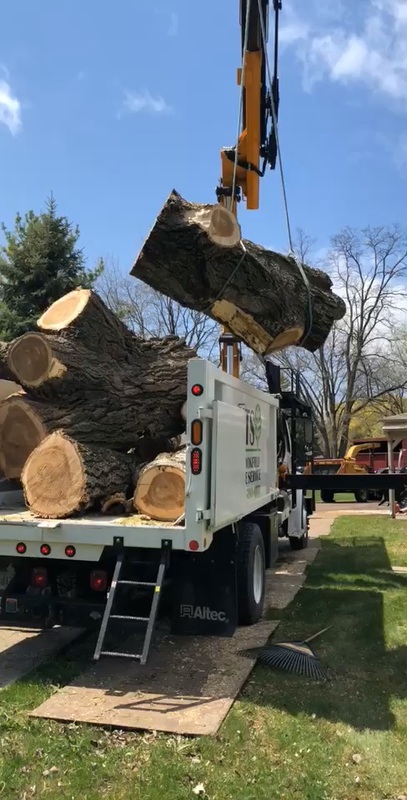 HTS can remove the wood and chips or leave them on your site. The job order can be written to cut wood into firewood lengths. Proper support can often delay a tree from splitting or breaking for many years. Quality work. Quick response. Fully insured.